For a country that can lay claim to many of the world’s great inventions – including Greenwich Mean Time, no less – you might think it strange that Britain has failed to make a mark on the horological world stage. Pub quiz experts will, of course, jump in here and remind us that Rolex was founded in London in 1905. But the company was moved to Switzerland in 1919 due to taxation making the cost of importing gold and silver to the UK too expensive. The company’s (mostly) Swiss roots give it the same nationality as many of the greats including, but by no means limited to, Blancpain, Breitling, Chopard, Frederique Constant, Hublot, IWC, Jaeger-LeCoultre, Richard Mille, Omega, Patek Philippe, Tag Heuer, Tissot and Zenith. So what about the British? Well fear not, because this is T3’s guide to Britain’s best watchmakers. Founded in 2004, the mission of Christopher Ward’s co-founders was simple: to use the same quality components as their Swiss competitors, but charge far less. They had recently discovered how one Swiss company was marking up its watches by 34 times, so set about producing similar quality timepieces for much lower prices. In 2014, Christopher Ward launched its own in-house movement, the Calibre SH21, which took four years to design and features a 120-hour power reserve. The company regularly updates its ranges and often sells watches in limited quantities, but sticks to a handful of key themes. Currently, this means refined dress watches, diving and sports watches, and timepieces dedicated to aviation and motorsport. A final category for 2018 celebrates a partnership with the Morgan sports car company. Headquartered in Henley-on-Thames, Bremont began life in 2002 with a goal to create high-quality pilot’s watches. Hand-built in limited numbers, Bremont watches are inspired by a love of historic aircraft shared by the company’s founders Nick and Giles English. But the name has a different story, having come from the surname of Antoine Bremont, a French farmer whose field the brothers made an emergency landing in while flying a malfunctioning 1930s biplane. Bremont’s hospitality was rewarded with the company being named after him. As well as watches designed for pilots, Bremont also sells diving and sailing themed timepieces, plus a motorsport range to celebrate a partnership with Jaguar. Bespoke watches designed to withstand extreme environments have been built by Bremont for the Royal Navy and US Navy, and a ladies' range is also available. Simplicity is the name of the game at Uniform Wares, whose men’s and women’s watches forgo numbers and Roman numerals for a clean and simple look across the entire range. Also missing from any Uniform Wares watch is the company’s name, part of the firm’s vision to focus on design and not branding. Another element of Uniform Wares’ philosophy is to keep the company’s entire creative output in-house at its London studio. However, some components are manufactured by international partners, and the watches are assembled in Switzerland – earning them the fabled ‘Swiss Made’ moniker. The firm’s watches all feature a stripped-back, minimalist design, while even models with a three-dial chronograph make do with just a single number denoting the seconds or fractions of seconds measured by each hand. Established in 2015 and located in Oxfordshire, Marloe Watch Company is, in its own words, on a mission to “reinvigorate the world of hand-wound timepieces”. Seeing itself as part of a counter culture, swimming in the opposite direction of the smartwatch movement, Marloe’s focus on mechanical, hand-wound watches is a bid to put tradition ahead of technology. Marloe’s watches are split into four collections, inspired by the city of Oxford, The Lake District, Loch Lomond and Antarctic exploration – all thoroughly British, we’re sure you’ll agree. As you might expect, Marloe’s watches stick close to tradition when it comes to aesthetics, but design flourishes include a nod to nautical charts on the face of the Derwent, and a map of the Antarctic on the case of the Haskell. Another modern British watchmaker located near Henley-on-Thames, Pinion was founded in 2013 by mobile application designed Piers Berry. The company began by producing a trio of automatic watches names Axis, with each drawing inspiration from instruments used in World War II. Taking a similar approach to Marloe, Pinion’s watches make use of hand-wound Swiss mechanical movements and take the form of something you would expect to see in the cockpit of a vintage aeroplane. Some models, like the Revival 1969, use a Swiss movement made in that year but never previously used. Such movements produce a slower tick-tock sound than those used from the 1970s onwards, helping to give these seemingly brand-new Pinion watches an old-school character. This Stamford-based company can trace its roots back for generations as a clock and watch repairer, but only began making its own timepieces in 2008. Since then, the firm has used “new, old stock” – that is, old but unused movements – for its Robin men’s watch and Robina ladies’ equivalent. As well as these, Loomes claimed to be the first to design and build a watch that is 100% British. The movement, case, dial, jewelled bearings and ancillaries of the Loomes Original were all designed and made by Loomes, plus a handful of other companies within an hour’s drive of its Lincolnshire workshop. Only 24 are being produced. 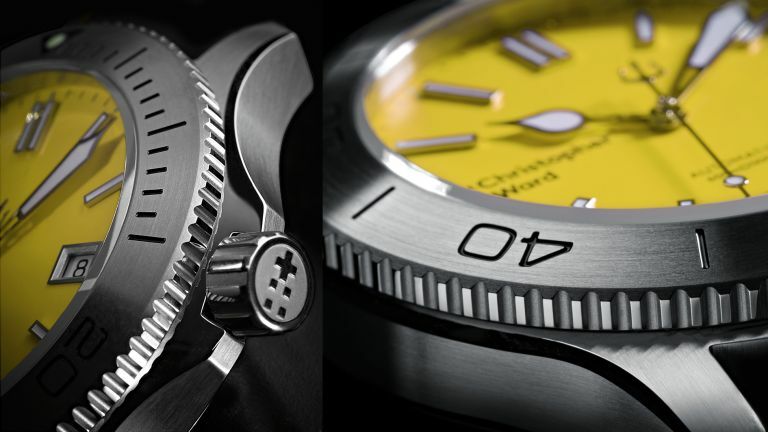 Headquartered in West Sussex, Schofield has been producing luxury watches since 2011. One of the company’s unique aspects is how it offers a “raw bronze” finish to its Beater model. Blasted with a coarse medium, this at first gives the watch case a slightly sparkling finish, but it soon picks up the dirt and grease of everyday life, subtly changing its complexation and giving the case a distinct patina. Like your favourite leather bag or the interior of a vintage car, the 44mm Schofield Beater develops a weathered look the more you wear it, giving it a unique character. A watch with patina, the company says, is a product that “reflects and represents time”.